Many of us just got our first telescope over the holidays, and let's face it — a telescope can be intimidating. It's a machine. It needs to be cleaned, properly aligned and calibrated. Even when you get it all set up, how do you decide where to point it first, with the whole night sky to explore? If you find yourself in this predicament, you'll want to check out the new book "See It with a Small Telescope" (Ulysses Press, 2017), by Will Kalif. It's an observation guide, mentor and historical tour all in one. The book lists dozens of objects you can find with a small telescope and provides handy star maps to reach each one. "Once you identify your first few constellations and learn the names of some of the brighter stars, you will quickly get a knack for it, and in no time you will easily recognize many more constellations," Kalif wrote. "From there, you will be able to star hop from one amazing celestial object to another." Near the beginning of the book is a nice list of easy objects to start with: the moon, Jupiter, Saturn, and the bright night-sky objects M13, M42 and M31 (nebulas, galaxies and star clusters cataloged by Charles Messier during the 1770s). It's really useful; I used a 4-inch amateur telescope for a little while in high school, and from that experience, I would recommend that readers start out with simple finds such as these, to build confidence. You can search for more-elusive objects when you have more experience. While you can use this book without previous knowledge of the night sky, it probably would be easier to use after you understand where the constellations are located. If you get a little lost, print out a star chart from an online source such as Stellarium.org, which Kalif recommends, and bring it outside with you on your first few nights. If you're into planet hunting, you'll also need to know where the planets are located right now, which you can easily find on websites such as Sky & Telescope (as well as Space.com). Let's assume, however, that you know the basic constellations, the bright stars and the locations of the planets. Kalif organizes his book into sections according to what kinds of objects you want to observe — for example, the moon, planets, star clusters, galaxies or nebulas. He picks out common examples of each, shows a star chart of where the object is located, tells you how easy it is to find and gives a brief description of the object. For example, I randomly chose Omicron Cygni, a triple-star system. Kalif explains what constellation it is found in (Cygnus), how bright each star is, where the stars are located using celestial coordinates, and when it is best to see them. He describes Omicron Cygni, in part, as "a beautiful triplet of stars, each with a different color" and ranks it as "medium difficulty" to find. A star chart on the next page guides readers to Omicron Cygni, using the stars of the Summer Triangle. By the way, while this book is not aimed specifically at kids, it's written very simply, at about the junior high level. So you can definitely give it to a motivated junior high or early high school student, although parents may want to help with some of the more complicated observational procedures. 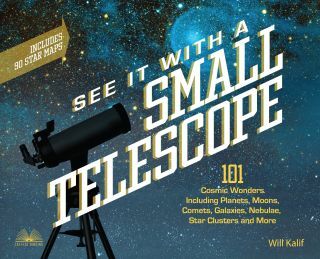 "See It with a Small Telescope" is a fun way to whet your appetite for telescope observations. By the time you work through the list of objects in the book, you should be confident enough to pick up a more advanced telescopic guide if you like. Or, you can keep visiting the same objects again and again to better appreciate how awesome they look. Happy hunting!